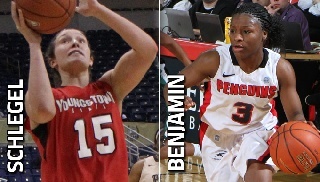 Youngstown State senior Heidi Schlegel was named First-Team All-Horizon League, and Indiya Benjamin was named to the all-freshman team as the conference announced its postseason honors on Monday. Schlegel is a first-team all-league honoree for the second consecutive season, and she is just the fifth player in school history to be named first-team all-conference twice in a career. She joins Danielle Carson, Dorothy Bowers, Liz Hauger and Brianne Kenneally in the select group, and each of the previous four are now in YSU's Athletics Hall of Fame. Benjamin is the second Penguin in as many seasons to be named to the Horizon League All-Freshman team, following Jenna Hirsch. Six YSU players were All-Newcomer Team selections prior to the all-freshman team's inception in 2013-14. Schlegel finished the regular season ranking third in the Horizon League with 17.9 points per game and 9.6 rebounds per game. The Wapokenta, Ohio, native also ranked second in the conference in double-doubles (11), third in free-throw percentage (.794) and fifth in the conference in field-goal percentage (.480). Additionally, she had the top two individual scoring performances in the league this season when she posted 38 points in back-to-back games at Milwaukee and Valparaiso in February. Schlegel was even better in league play when she averaged 20.7 points and 9.8 rebounds while shooting 53.1 percent from the field and 81.9 percent from the free-throw line. Benjamin finished her first regular season averaging 9.1 points and 3.7 assists overall and 8.9 points and 3.6 assists in league play. She ranked seventh in the conference in assists per game and assist-to-turnover ratio, and her .357 3-point field-goal percentage ranked eighth in the league. She led all Horizon League freshmen in assists, and she ranked fifth in scoring, second in 3-pointers and third in minutes. The native of Lima, Ohio, scored in double figures 14 times, and her 46 3-pointers are the second most in program history by a freshman. Wright State senior Tay'ler Mingo was voted the Horizon League Player of the Year, and UIC junior Ruvanna Campbell was tabbed the league's Defensive Player of the Year. Valparaiso's Dani Franklin was named the Freshman of the Year and Sixth Person of the Year, and Wright State's Mike Bradbury was voted the league's Coach of the Year. Schlegel, Mingo and Campbell were joined on the first team by Milwaukee senior Ashley Green and Cleveland State senior Cori Coleman. Three Green Bay players, Megan Lukan, Mehryn Kraker and Tesha Buck, were on the second team, along with Cleveland State's Imani Gordon and Detroit's Rosanna Reynolds. In addition to Benjamin and Franklin, Milwaukee's Jenny Lindner, Detroit's Darianne Seward, and Valpo's Jasymn Walker were voted to the All-Freshman Team. Campbell, Mingo, Lukan, UIC's Terri Bender and Oakland's Sinclair Russell made up the All-Defensive Team. The league awards were voted upon by the conference's coaches, women's basketball sports information directors and a media representative from each market. Schlegel was also named First-Team All-Horizon League by College Sports Madness. Youngstown State will begin postseason play on Wednesday as it hosts Detroit at Beeghly Center in the quarterfinals of the Horizon League Tournament. Tipoff against the Titans is set for 7:05 p.m.